Micro mosaic in Salty Filati is a prestigious, antique technique that developed in Rome between the XVI and XVII centuries. Since 1727 it was used by Mosaic Masters from REVERENDA FABBRICA DI SAN PIETRO in Vatican City. It was probably invented by the mosaic master Giacomo Raffaelli, one of the most important mosaic artist living between 1700 and 1800. Originated in 16th century, it was an attempt to become independent from Venice, which had been the centre of glass mosaic material manufacturing. The Vatican’s own glass factory carried out a research program which led to the production of no less than 28.000 glass mosaic colors. It was however, in Smalto (glass mosaic) manufacturing technique that the Vatican artisans attained their greatest achievements and fostered further developments. This was made it possible because a Roman glass kiln owner, Alessio Mattioli experimented on glass Madritinte (master tints) pancakes, namely colored glass paste, containing a high percentage of coloring agents. To make ” Smalti Filati”, depending on the shade of color to be obtained, bits of different master tints are mixed together and then melted over an open flame. The molten mass is the “spun” or drawn by means of tweezers into threads of the desired thickness. Filato rods, drawn into strings of 20 – 30 inches and varying in thickness between 1 and 4 mm, do not require annealing and are simply allowed to cool for a few minutes before being broken up. With this type of smalto manufacture, a virtually unlimited range of color shades can be obtained simply by mixing a different variety of master tints. At present, the Vatican Studio ,who first took advantage from Mattioli discoveries, has about 28.000 colors in stock. The “smalti filati” technique made it possible for mosaics makers to execute copies of painted originals on an even smaller scale and eventually even to produce actual “miniature mosaics” with “tesserae”, less than 1 mm thick, which gained widespread popularity in the first half of 18th century. Of course the views of Rome, including the Colosseum, St. Peter’s Basilica, the Pantheon and Forum ruins, are the main subjects for micro mosaics. 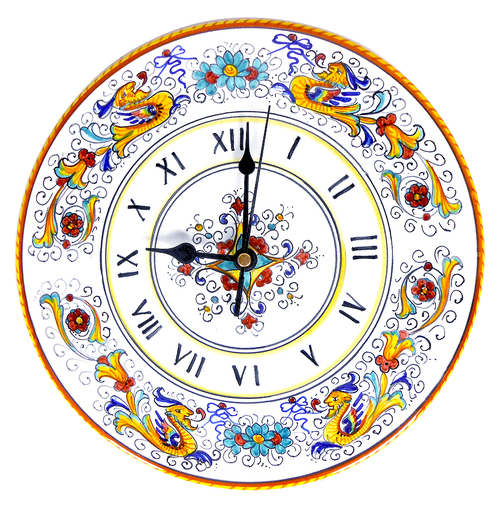 Manufactured by independent workshops for bourgeois clientele, such as foreign travelers, religious and lay aristocrats, diplomatists and kings on official visits, these minute mosaics were employed to embellish small, everyday objects (paperweights, snuffboxes, vases, top of tables, small framed objects, jewels). These micro mosaics were often regarded as items of jewelry on account of their artistic refinement and technical virtuosity. Manuela Farneti: “Technical – Historical Glossary of Mosaic Art” Longo editore Ravenna.